Dawood was born 5th July 2014 he was born ok weighing 7lb and 4 ounces. A week after his birth he kept losing weight. He was becoming really weak and the doctors didn’t know what was going on with him. We had to stay in hospital whilst my eldest stayed with my parent’s. We were in and out of hospital and still my son was losing weight. So whilst we were in hospital they just carried out blood test to see if they could find out what the problem was. Well at the end of September they found out he had Zellweger Syndrome which we had never heard off. Unfortunately, he passed away peacefully on 20th October 2014. After his death it was really hard to move on. I then found out I was pregnant again which was unexpected. When my son got diagnosed with this condition we were told many things, we found out that the condition is genetic. The doctors said they could test before 12 weeks into the pregnancy but I didn’t agree to this. I was just hoping for the best and praying I would have a healthy child. Inaaya was born in 19th June 2015 a healthy baby weighing 6lb 4 ounce. We couldn’t tell if she had the condition because her features were different. 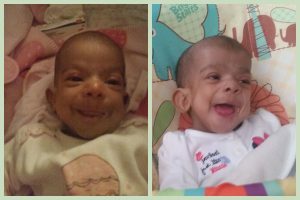 The doctor said we could test Inaaya to see if she has got Zellweger Syndrome, I said no but he said we know what to expect if we wanted to. I later agreed and they tested her and it came back she had the same condition as her brother. This was upsetting news because now we have to go through it again with our little girl.